To promote our products all you need is a Clickbank account and you're ready to go. No waiting for your commissions, get the CASH instantly into your account! We've been a Clickbank Platinum member for the past 6 years, so you're in good hands with our offers! I have an incredibly high stick rate. Double that of the average continuity offer. The average dollar per sale is currently $245.44. This makes my products some of the strongest products in the market today. Just wait and reap the rewards over time! I'm Nadine Piat, a certified coach, writer and speaker and I’ve been coaching women and men for over 10 years about love, attraction, confidence, self-worth and communication. I have extensive real experience with real humans and many years under my belt. I personally created my programs. 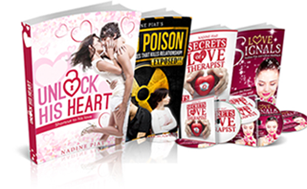 They are rich in quality content and offer powerful and highly effective solutions for women’s challenges around finding and keeping love. Yes please! My offers have low refunds which is good for you, and me!